The Hondurans who banded together last month to travel northward to the United States, fleeing gangs, corruption and poverty, were joined by other Central Americans hoping to find safety in numbers on this perilous journey. But group travel couldnt save everyone. Earlier this month, two trucks from the caravan disappeared in the state of Veracruz, Mexico. One person who escaped told officials that about 65 children and seven women were sold by the driver to a group of armed men. Mexican authorities are searching for the migrants, but history shows that people missing for more than 24 hours are rarely found in Mexico alive or at all. An average of 12 people disappear each day in Mexico. Most are victims of a raging three-way war among the Mexican armed forces, organized crime and drug cartels. The military crackdown on criminal activity has actually escalated violence in Mexico since operations began in 2006, my research and other security studies show. Nearly 22,000 people were murdered in Mexico in the first eight months of this year, a dismal record in one of the worlds deadliest places. Central Americans fleeing similarly rampant violence back home confront those risks and others on their journey to the United States. Doctors Without Borders found that over two-thirds of migrants surveyed in Mexico in 2014 experienced violence en route. One-third of women had been sexually abused. Mexicos security crisis may explain why so few caravan members want to stay there. In response to President Donald Trumps demands that Mexico stop this onslaught, Mexican President Enrique Pea Nieto announced that migrants who applied for asylum at Mexicos southern border would be given shelter, medical attention, schooling and jobs. About 1,700 of the estimated 5,000 caravan members took him up on the offer. Meanwhile, everyday Mexicans are greeting the migrants as they pass through their towns, donating food, clothing, lodging and transport. 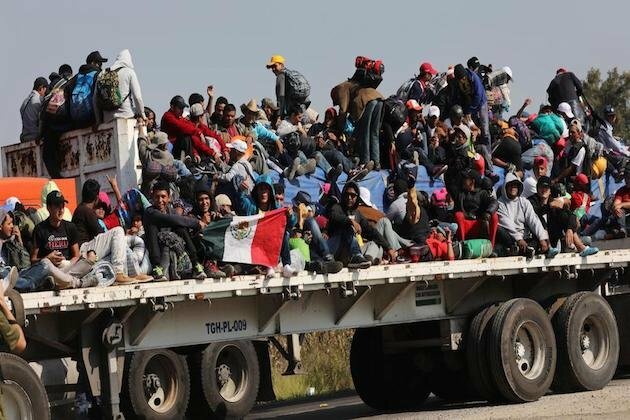 A recent poll shows that 51% of Mexicans support the caravan. Thirty-three percent of respondents, many of them affluent members of Mexicos urban middle class, want the migrants to go back to Central America. Mexican law, which allows eligible asylum seekers to both request and be granted asylum, exceeds international standards on the rights of migrants. But reality in Mexico often falls short of the law. The Mexican Refugee Assistance Commission is supposed to process asylum applications in 45 days. But its offices in Mexico City were damaged by last years earthquake, forcing the already overstretched and underfunded agency to suspend processing of open asylum claims for months. Meanwhile, new applications for asylum in Mexico continued to pour in a record 14,596 were filed last year. The processing backlog is now two years. During that period of legal limbo, asylum seekers cannot work, attend school or fully access Mexicos public health system. President-elect Andrs Manuel Lpez Obrador, who takes office on Dec. 1, says he will offer Central American migrants temporary working visas while their claims are processed. Anti-caravan posts on social media accuse migrants of taking Mexican jobs and violating Mexicos sovereignty, using nativist language similar to that seen in the United States. Mexico City, which in 2017 declared itself to be a sanctuary city, nonetheless put thousands of caravan members up in a stadium staffed by medical teams and humanitarian groups. The first Central Americans from the caravan are now arriving at the U.S.-Mexico border, where they face a far less warm reception. Calling the caravan an invasion, President Trump has ordered the deployment of over 5,000 troops to the border. U.S. law prohibits the use of the armed forces to enforce domestic laws without specific congressional authorization. That means the troops can only support border agents in deterring migrants. But Trumps decision still has symbolic power. This is the first time in over a century that military troops have been summoned to defend the U.S.-Mexico border. The last deployment occurred during the Mexican Revolution. On March 9, 1916, a small band of revolutionaries led by Francisco Pancho Villa invaded Columbus, New Mexico. Officially, the group assaulted the border city in retaliation for then-President Woodrow Wilsons support of Venustiano Carranza, Villas political rival. Villa also had a personal vendetta against Sam Ravel, a local man who had swindled money from him. President Wilson responded by summoning General John J. Pershing, who assembled a force of 6,000 U.S. troops to chase Villa deep inside Mexicos northern territory. Pershings punitive expedition returned in early 1917 after failing to capture the revolutionary leader. Central Americans who reach the militarized United States border can still apply for asylum there, despite President Trumps recent executive order limiting where they may do so. But they face stiff odds. After an evaluation process that can take months or years, the majority of Central American asylum claims filed in the United States 75 percent are denied. Caravan members rejected will be sent back to the same perilous place they fled last month. With 60%of its population living in poverty, Honduras is the poorest country in Latin America. It also has the worlds second-highest homicide rate 43.6 murders per 100,000 people trailing only El Salvador. The U.S. contributed to the instability that created these hardships. Honduras has been in turmoil since 2009, when the military overthrew leftist President Manuel Zelaya. Rather than join the United Nations and European Union in demanding Zelayas reinstatement, then-Secretary of State Hillary Clinton called for new elections, effectively endorsing a coup. The country entered a prolonged political crisis. Hondurass November 2017 presidential election was contested, with the U.S.-backed President Juan Orlando Hernndez accused of rigging the vote. Seventeen opposition protesters were killed in the unrest that followed. The Central American caravan that started in Honduras seeks in the U.S. a life free of such violence. Its steady progress toward the border shows that even kidnappings, Trumps threats and soldiers cannot deter them. (The writerLuis Goomez Romero is Senior Lecturer in Human Rights, Constitutional Law and Legal Theory, at the University of Wollongong).